While tripods aren’t glamorous, are a hassle to carry and despite gains in vibration reduction/image stabilization, it is still almost essential to have one in every photographer’s tool bag. 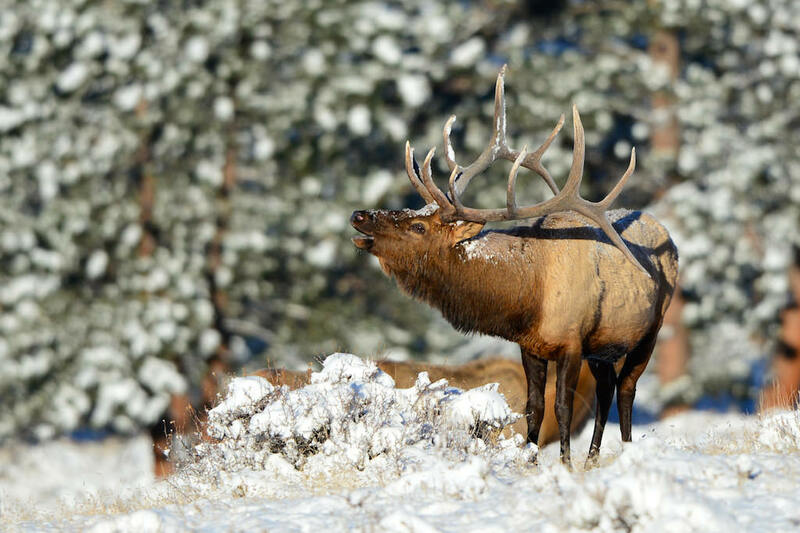 When looking to photograph landscapes or wildlife, many times the difference between a nice photo and a great photo can be whether a tripod was used or not. 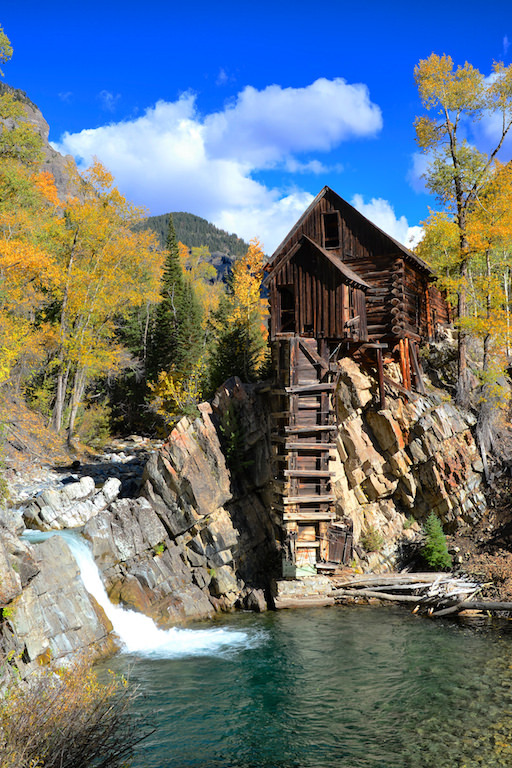 Long exposures and long lenses both benefit from camera stability. So if you haven’t got a tripod and you are looking to improve some of your photos I would suggest you consider adding one. A quick search for a tripod will reveal to you that there’s a wide range of styles and materials with equally wide ranging pricing. So if you are new to this and somewhat confused on what to buy, check out Nasim’s article, How to Choose and Buy a Tripod. With that said, here is a review of a good, affordable carbon fiber tripod and ball head, the Oben CT-2320 with BB-2 ball head kit which has been kindly provided by B&H Photo. Made of 6x carbon fiber, this tripod is lighter as well as more comfortable to handle in cold weather than a comparable tripod made of aluminum. 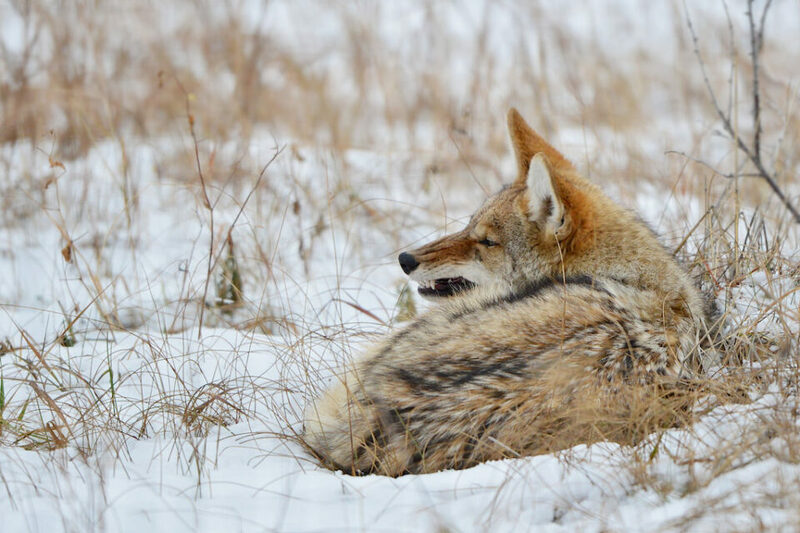 Speaking of cold weather when using it in cold weather, I found that when extending or collapsing the sections, they would bind and not move as smoothly as they did when warm. At the top of each leg is a latch that unlocks by pulling out and allows each leg to spread to 3 different angles. One thing that I found as a disappointment is the amount of leg spread. When opened so that the tripod is its tallest, the legs do not spread enough to give me a feeling of stability. Sure, you can spread the legs more to the next leg angle adjustment, but it will drop the height of the tripod significantly. If using a lighter set up, such as with a wide angle lens, it’s fine, but when I used it with a large telephoto lens, it gave me a feeling of insecurity. 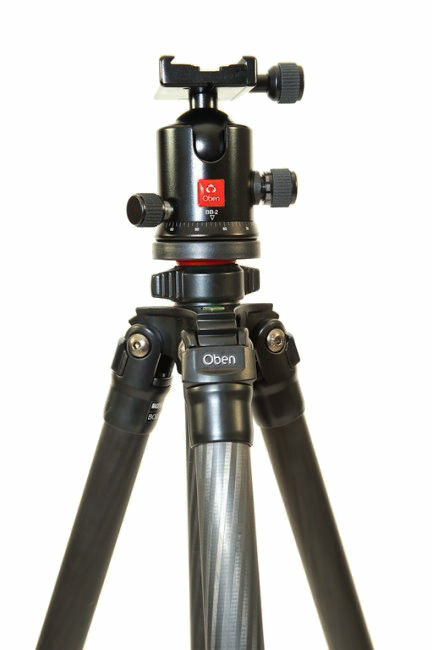 In comparison with my Gitzo Systematic tripod, if both are set to the same height as measured to the base of the mounting plate, the Oben legs are approximately 11 inches closer together than the Gitzo, resulting in a much smaller circumference of the legs. 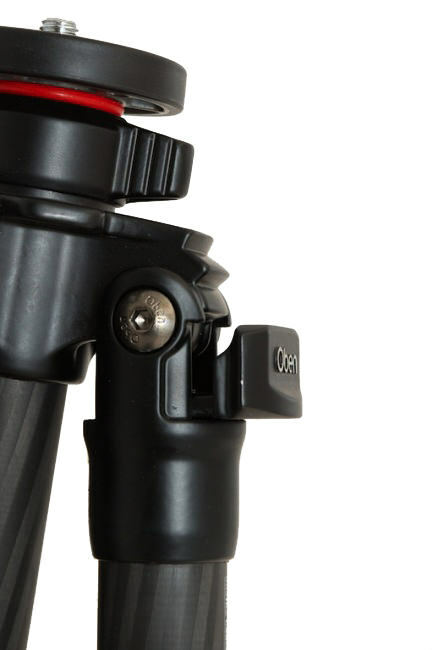 You can see this in the photo below where the Oben tripod fits well inside the Gitzo tripod. My gear always feels stable and secure on the Gitzo, but with a 300mm lens or larger mounted on the Oben the gear felt like it could tip over too easily for my comfort. For easy minor height adjustments, there is a center column and included at the bottom of the column is a counter weight hook. Things I don’t like about center columns are that they add instability as well as prevent the tripod from being closer to the ground for a lower perspective. 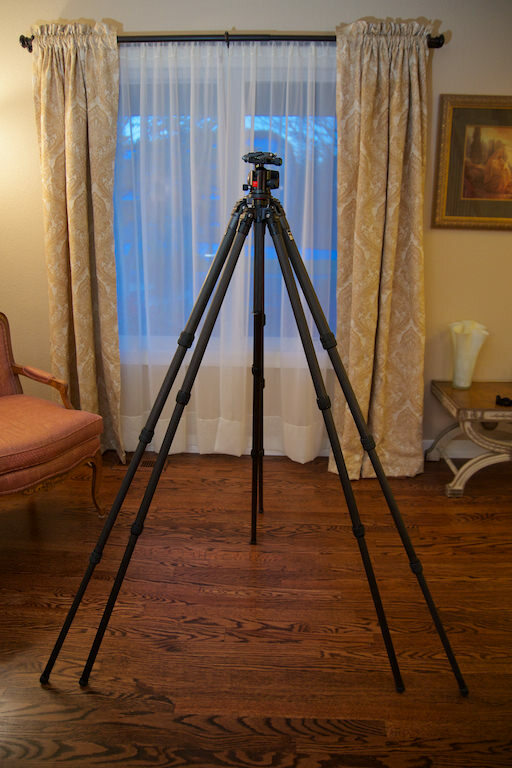 The lowest that this tripod will go is to 12.5″ from the ground, compare that to 3.7″ from the ground for the Gitzo. 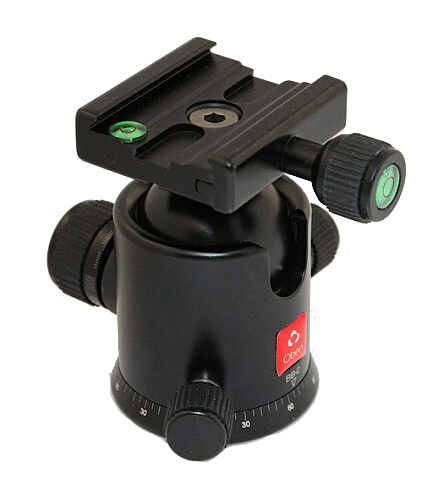 It would be better if the center column could be removable similar to the Gitzo systematic tripods which allows you to use or not use a center column as you prefer for any given situation. Each section locks with twist style locks, which appear similar to the locks used on the Oben CTM-2500 Monopod previously reviewed. However, the locks on the tripod operate more smoothly than they do on the monopod but that could be due to sample variation. For traveling, another thing to consider with tripods is the number of sections in the legs. 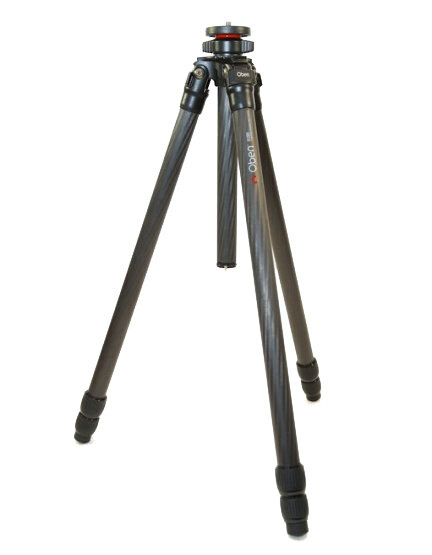 A tripod made with 3 section legs as opposed to 4 or 5 sections, will result in an overall longer tripod when collapsed. This longer overall length results in a tripod that will not fit in my carry on luggage, unlike my 4-section Gitzo Systematic tripod that will. Finally, a couple of small items, first, there is a clip similar to the one found on the Oben CTM-2500 monopod which attaches to the leg and holds two allen/hex wrenches for adjustment and second, Oben provides a nice carrying case. 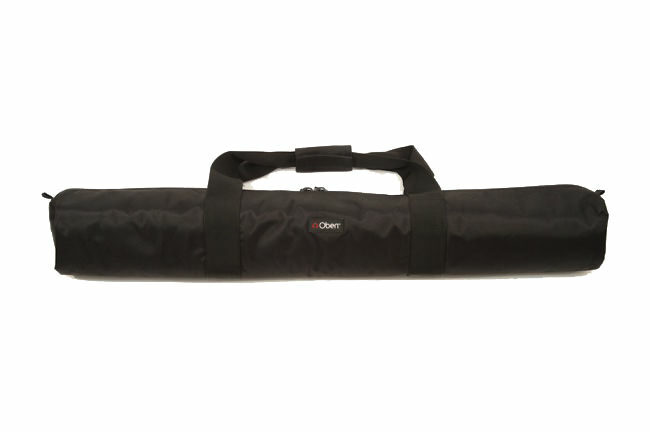 It is a sturdy canvas zip up bag with a handle which is much more substantial than the thin bag that comes with the Gitzo. In summary, the CT2320 from Oben is a nice tripod and although not preferable to the Gitzo Systematic, it’s much more affordable. If you are mainly using it for landscapes, portraiture or with smaller lenses, then this is a good tripod. 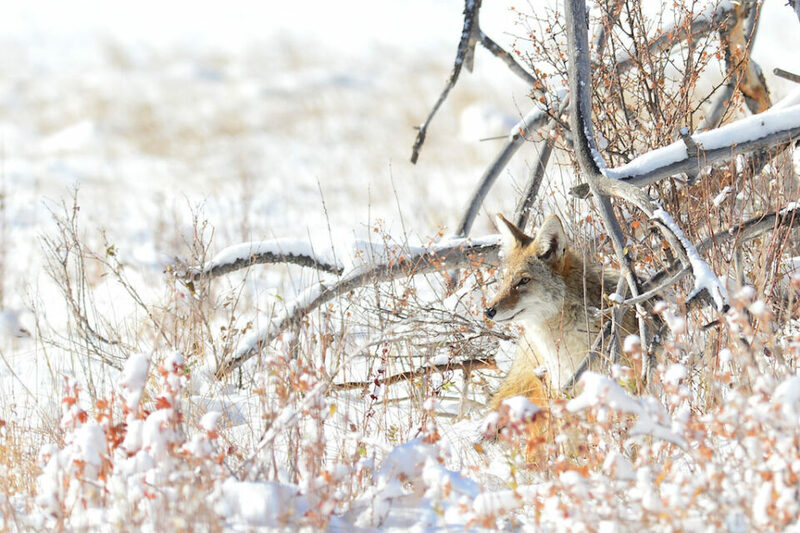 If you are using it for larger telephoto lenses, I would recommend you consider a tripod with a wider stance. The BB-2 is constructed of lightweight aluminum and utilizes an Arca-Swiss style quick release clamp system that allows for simple attachment and removal of the camera. The three adjustment knobs (a main lock-down knob, a tension control knob and a panning lock) are large enough to turn even with gloves and each has a rubber grip on it to make doing so comfortable even without gloves in cold weather. The knob that locks the plate into the head is also large with the rubber grip just like the adjustment knobs and this is an improvement over the system found on my Gitzo Ball Head. 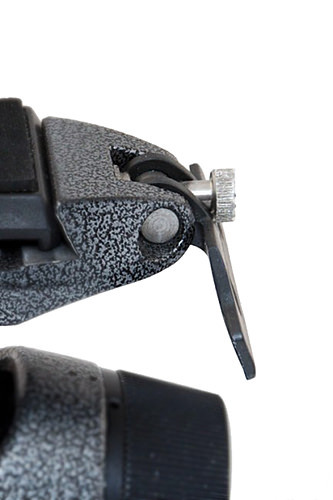 In comparison, the Gitzo has a very thin flip lock plate with a tension adjustment screw that it is small and with no rubber coating making it hard to adjust with gloves or in the cold. The thin lock plate is so thin that it tends to cut into my hand/fingers when it is locked and this discomfort is magnified when it is cold. 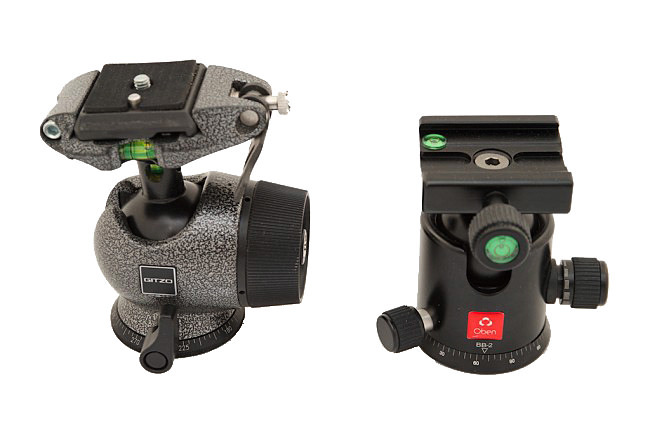 Thus, I prefer the more comfortable round knobs on the Oben Ball head to the Gitzo. 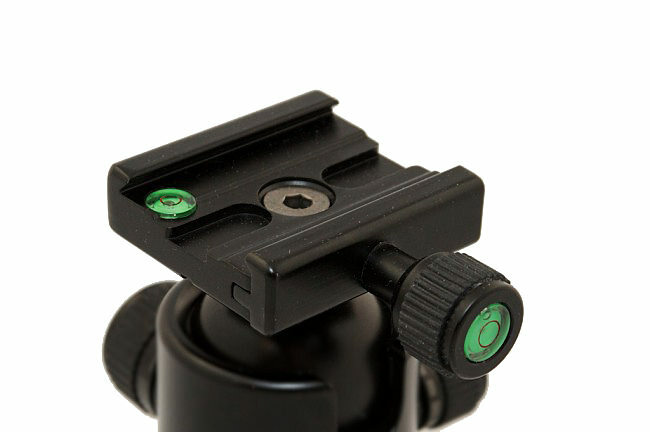 There is a spirit level on top of the quick release clamp but it will be covered with the lens foot or the plate, so it can only show you that the tripod and head are level prior to attaching the camera. A second sprit level is on the end of the quick release plate knob for use when the camera is in a vertical orientation. The head will pan a complete 360º and there are markings along the base to help you orient your shots for multiple exposures. Likewise, the tension knob has index marks to indicate relative tension but personally, I found them of little value, unlike the 360º pan markings which are more useful. 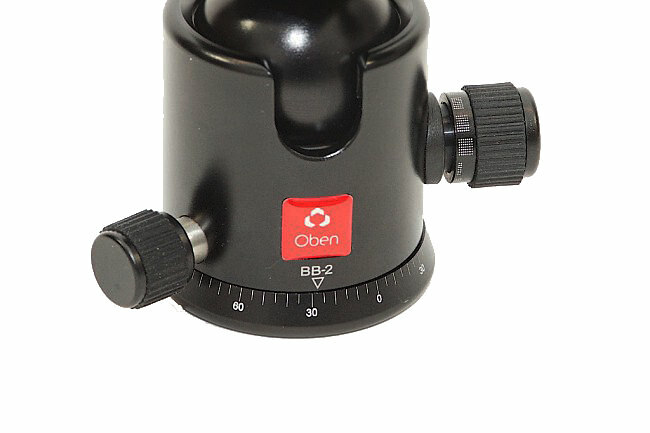 Oben has made a very nice ball head especially at this price, I do wish the level was visible while the camera is mounted, but that can be overcome with an inexpensive hot-shoe bubble level. Overall, the Oben CT-2320 carbon fiber tripod and the BB-2 ball head kit represent a good value compared to the Gitzo tripod and head considering that the Gitzo kit costs twice as much. If you are mainly doing landscapes or have smaller gear, this tripod would work very well, it is light and affordable for the features, however, placing a $3000 camera and a $6000 lens on it would make me think about spending a few hundred dollars more on the tripod for the added sense of security. I found the Oben BB-2 ball head to be a very nice ball head in terms of performance, weight and price. The only real quibble I had with the BB-2 was the placement of the spirit levels. FYI, many of the images did not open using IE, Firefox, or Safari, even after reloading the page several times. David, please refresh now – I had to reupload some of the images. Will you guys be reviewing the Sirui carbon fiber tripods+heads? They are a new cost effective tripod that seems to be pretty good and very compact. I’d be very interested to see how they perform compared to the more pro level Gitzos that you guys use. Thank you for visiting and for the comment, Mike. I am open to that if we can get our hands on one. I checked your link and it does appear to be cost effective. Thanks for the tip! Thanks Tom, hopefully you’ll be able to get a hold of one. I second Mike’s suggestion for a review of the Sirui tripods. I saw some in B&H a few months ago. What I liked about the was that several had a removable leg/monopod that seemed longer/stronger than some other tripod/monopod combinations. Personally, I have not been that impressed with the Benro Travel tripods/monopods and am curious how the Sirui tripods/monopods would compare. I hope you can get one to review! Niggi, I see similarities but I don’t see enough of the same shapes/components to think that they are the same. Some products you will see rebranded and they are exactly the same. I don’t think I see this here, but regardless, they could be made by one or the other or they both could buy parts from the same manufacturer. How do you like the PH-20 gimbal head? Have you had it long? Thanks Niggi for the feedback, I’m glad that is is working out for you. I will look forward to seeing some of the Sirui products in person in the future. I like the GT3532S and the Arca-Swiss Monoball Z1 sp with Quick Release. The tripod does not have bubble level while the head is out of stock. 1. the disadvantages of no bubble level on the tripod? 2. the disadvantages of no bubble level on the head? 3. Can both be replaced by a hot shoe bubble level? Rav, if you are taking a single shot, yes a hot shoe bubble will give you a level horizon. 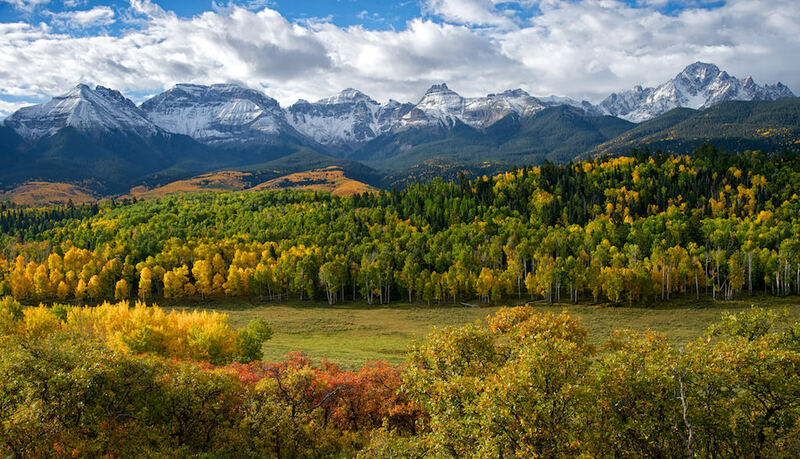 If you are taking a series of photos to stitch together to make a panoramic, then you need the base of the tripod level so that the head will rotate level. A hot shoe bubble will only show you that the camera is level at that particular position. Once you rotate the head, if the base is not level, then the camera is no longer level and the horizon shifts. Considering you own a GT3532S, does it have a bubble level? The specs section on Gitzo’s web page doesn’t say so, but the picture shows a bubble level. One B&H chat rep told it doesn’t have it, another said it has it. I am confused. Ravi, I own a GT3542LS and it does have a bullseye type spirit/bubble level. I have had this a few years and can’t speak for a different model or the current version, should it have been modified. I would have to trust Gitzo’s website and order based on what Gitzo says. in the “our gear” the tripod link points to GT3532S. that is why I thought you had the GT3532S. anyways, thanks for your help. On Gitzo’s page the picture shows it has a bubble level, but the specs doesn’t. Gitzo confirmed by email there is a built-in bubble level and need to update their specs. Ok, I see, that link is from Nasim and Lola. In the body of this post, there is a link to “Gitzo Systematic” that actually points to the one that I have and referenced, the GT3542LS. Sorry for the confusion but glad that you have it figured out. Not to my knowledge, but could be.